I’m a relatively fresh face at the Hydrangea Appreciation Society. I’m not sure why I’ve overlooked these beautiful mop headed flowers until the last few years. But I have. And by overlooked, I don’t mean totally ignored. I’ve always had a couple of hydrangea bushes in my garden, and I’ve always picked them and enjoyed them. I’ve especially extolled the virtues of the zesty green leaves which, on one of my plants at least, I am able to pick year round almost. I just think I haven’t really appreciated them or loved them as much as I should have, or do now. I’ve been taking them for granted! Now I almost can’t get enough of them. All those beautiful petals, and those amazing full flowers, and those colours! One of my neighbours at the beach has a bach literally surrounded by stunning ‘big headed’ pink hydrangeas. Luckily for me, she is a very generous sharer. A day or two after we arrived for our holiday Brenda was on the door step, in the pouring rain, with a huge bunch of beautiful blooms. If I’d chopped this many off one of my plants there literally would be nothing left. Not so with Brenda’s hydrangeas – you couldn’t even tell where they’d come from. Of course, I was exceedingly grateful, and spent the afternoon faffing happily. And then, after giving a friend a ride back to Wellington, she too arrived laden down with blooms. Gorgeous blue and deep violet hydrangeas from her mother’s garden. I was feeling especially lucky. Hopefully soon though, I can redress the balance, so that I can be the one doing the giving. Last summer I planted five different hydrangeas along one of our fence lines at the bach. A year later I am happy to report that they seem to have survived the bunnies, my father’s mowing attempts and general neglect, and are actually doing well. So well that I could pick my own flowers and have taken a leap of faith and planted another five. And now that I’m back in Wellington, I’m determined to squeeze in another one or two varieties in our small garden here. 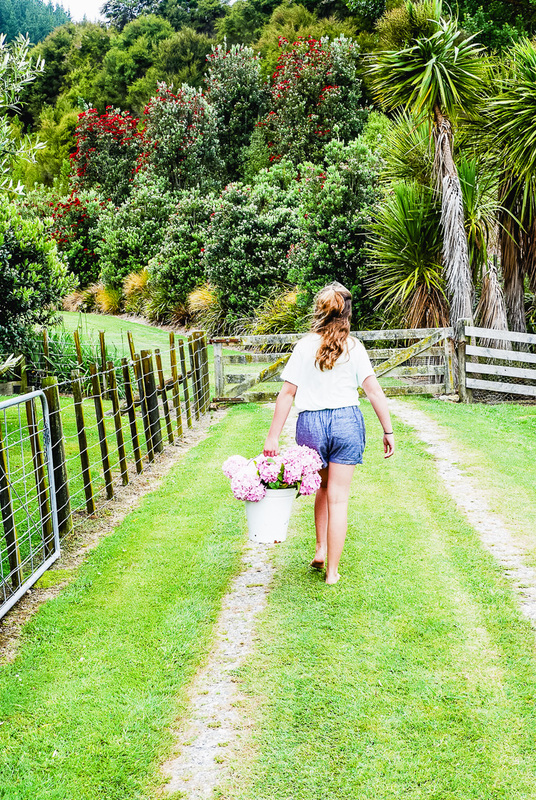 Pick your flowers early in the morning or in the cool of the evening, but avoid the heat of the day if possible. Take a bucket of warm water out into the garden with you, and after cutting the stems on an angle, immediately place them into the warm water. 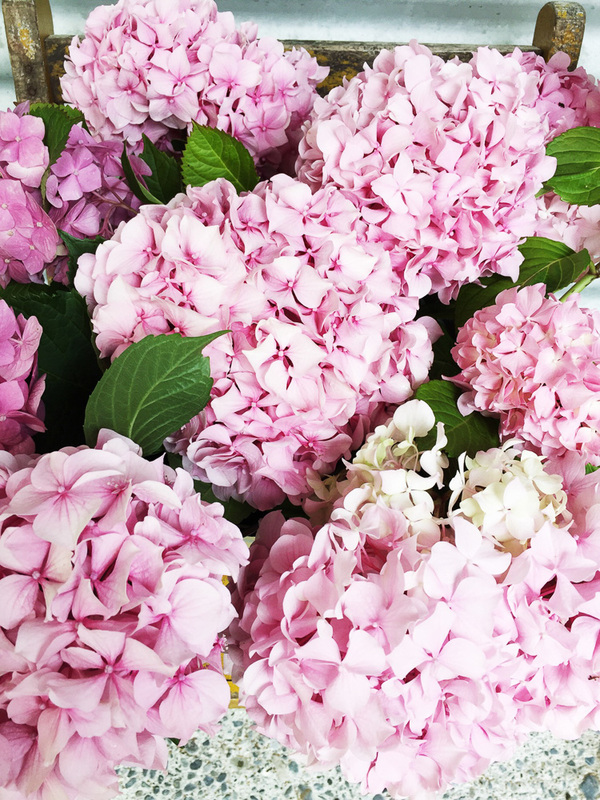 Leave the hydrangeas in the warm water for as long as you can (at least half an hour) before recutting the stems on an angle and arranging in fresh cool water in your vase. Remove all leaves that will be under water. 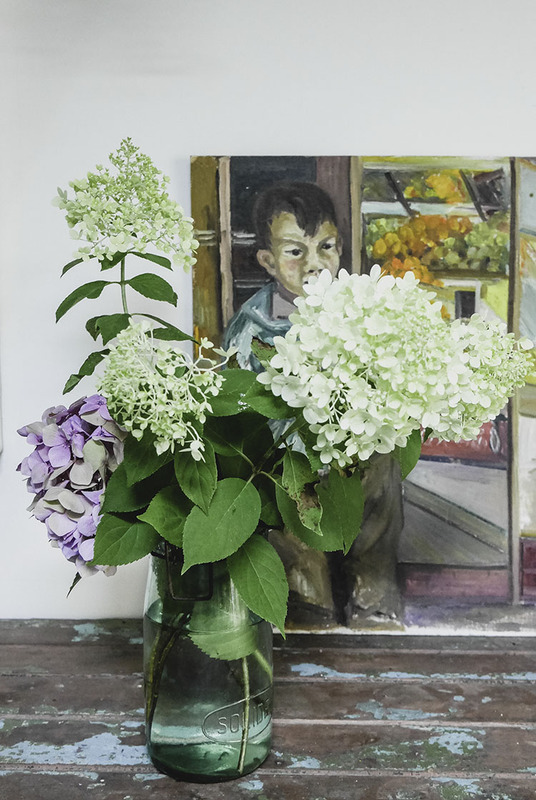 If the hydrangea wilts, recut the stem and repeat the warm water treatment. Spraying the flower heads with water or dunking them in water can also help revive them. 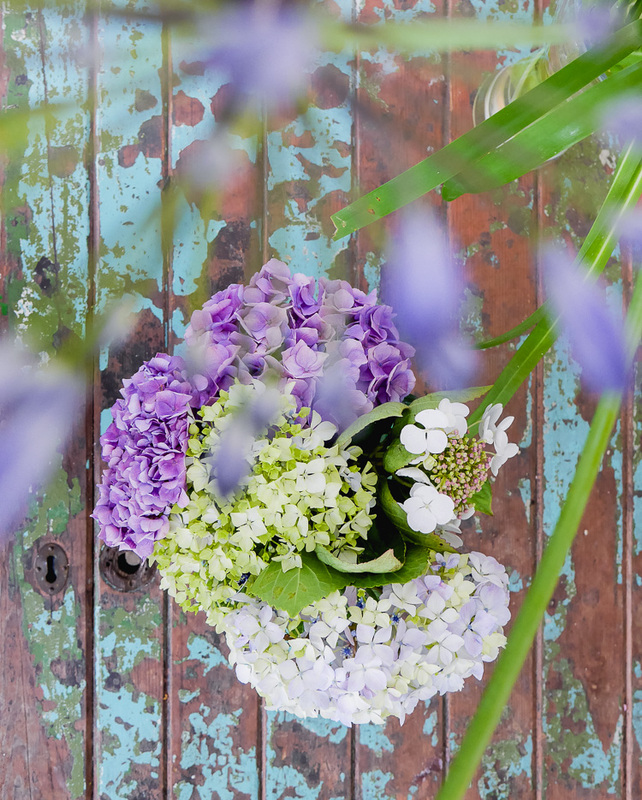 I also love using hydrangeas on the low-down by almost floating the flower head in a bowl. Cut the flower head off (ouch), leaving just enough stem to fit the bowl. Take the leaves off and add these to the side of your container. 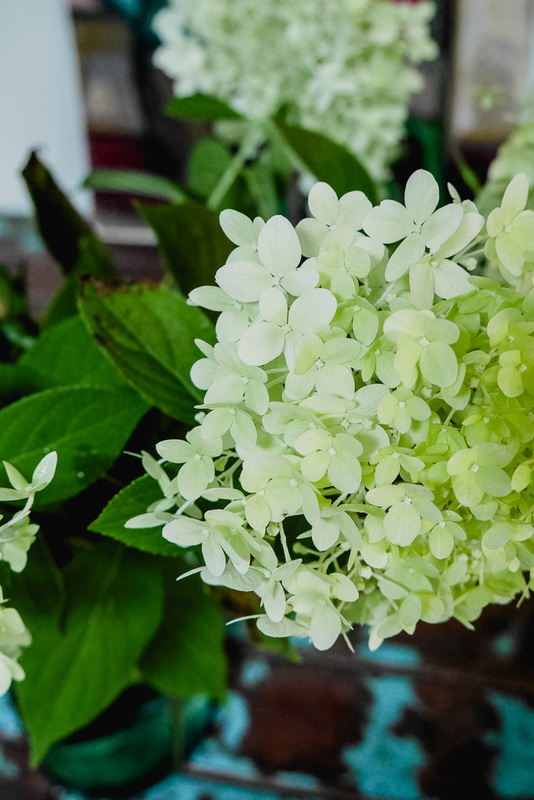 They last beautifully, and I do this year round at home – hydrangea leaves with whatever flowery bits I can find to go with them in a vintage bowl. Sometimes I’ll even use fresh leaves with a dried hydrangea flower. Brenda tells me that some of her hydrangeas came from a cutting from a plant that was originally somewhere on our beach section. So, come autumn, I’ll be back foraging at Brenda’s in an attempt to strike a cutting of the original plant. Hope my thumb is green that day. I loved reading about the flowers and the growing of hydrangeas. Living in a condo. The only flowers I get are the ones from the store. I look forward to following you.